Kid's table: dollar store table cloth, spider ring around the napkin,wax vampire teeth, vial of monster eyes (vials from Zulily with Reeses Pieces), mason jars and bat straws awaiting their beverage, and monster party bags to collect all the prizes and favors (Oriental Trading). Even though it had just been three months since we moved into our new home in another state, I was "dying" to have a Halloween party! 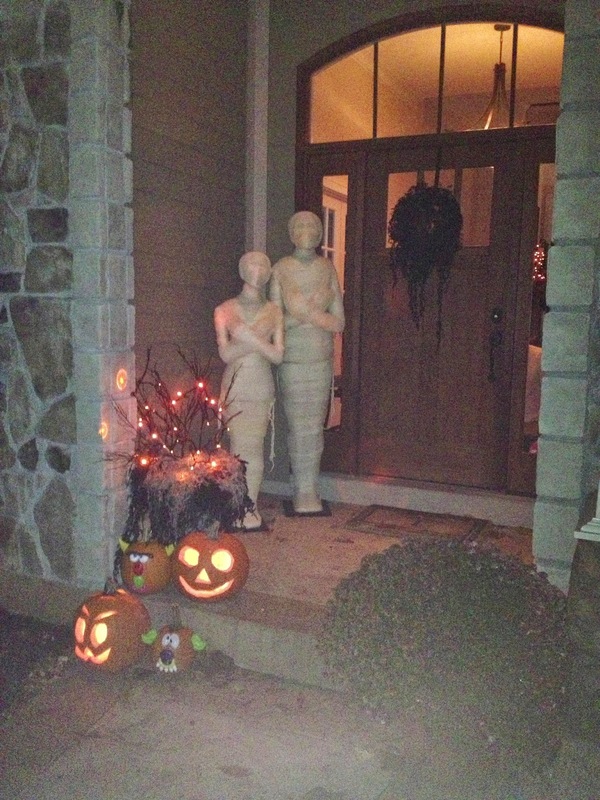 We didn't have one the previous year and I was bursting at the seams with new ideas and Halloween decor! Plus, our new basement was just screaming for a party! Thankfully, this also put me on a strict timeline to get every last box unpacked. However, while I spent many years trying to figure out how to put a limit on our party invites with an amazing abundance of family, friends and neighbors nearby, I was now faced with the task of finding enough party guests to make it a party. Thankfully, we had met some great neighbors with kids close in age to the boys and one of our favorite family friends just happened to be able to hop on a plane with one of their three kids and join us! Before I get into the details, I need to say that this party wouldn't have turned out as fun as it did if it wasn't for my mom.Those of you who know me understand what I am talking about, and for those of you that don't, check her out on her own blog www.whathappensatgrandmas.com. There you will see an abundance of creative, fun and amazing ideas for crafts, holidays, events and more!! After greeting our guests at the door, they were instructed to follow the short path of pumpkin lanterns lit with non- flammable battery operated candles downstairs to the basement. While a table of Halloween themed treats awaited you, so did this spooky menu and small bar for the adults. Cider? Bloody martini? Or perhaps an Oktoberfest served in a glow in the dark glass? These fun martini and beer glasses came from Windy City Novelties and were a hit! And just in case you were wondering what's for dinner...no it's not YOU!! Our guests dined on swamp chili, bat wings, mummy dogs, pumpkin poop (cheese balls), crispy cockroaches (chocolate covered nuts), witches fingers and monster parts (veggies). Pumpkins (Rice Krispy treats), chocolate covered spiders and frosted cookies also awaited hungry guests for desert. In addition to the many battery operated and real wax candles, we had the lights dimmed and a black light behind the bar. This black light illuminated the creepy jars filled with glow in the dark water (tonic water + black light = glow in the dark water), filled with snakes, spiders and insects! 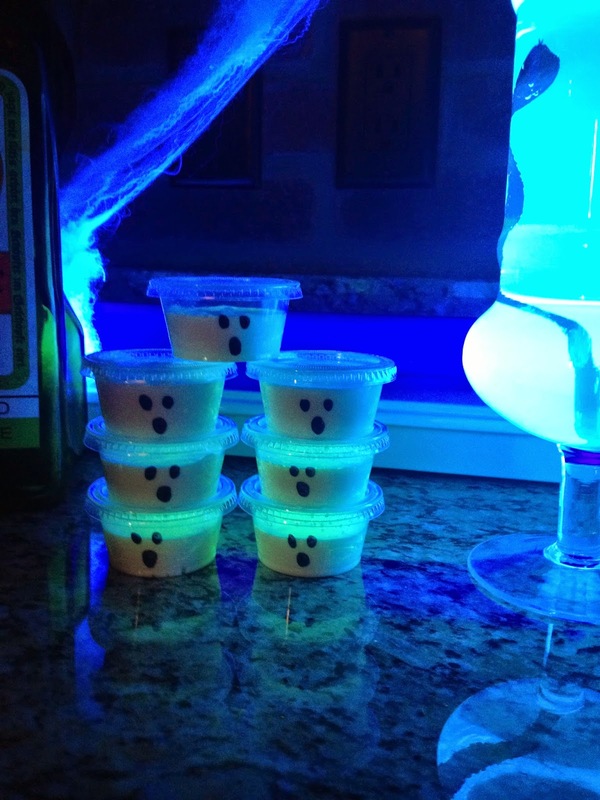 One of our party favors, homemade glow in the dark ghost gak was also illuminated from the black light. The recipe I used can be found here. At this table, it was spin the wheel for a prize. Prizes were laid out and replenished according to the numbers. There was also Halloween Plinko. Each guest got three chances at dropping the disks down the board. Once the kids added up the numbers each disk landed on they got to pick a prize. We had an array of prizes consisting of spider rings, large plastic spiders, glow in the dark bouncy balls and little flashlights. The next game was sticky skeleton darts designed and crafted by mom. The little ghouls and goblins got five chances to get their sticky dart on or near numbers. Once they added up their numbers it was off to the prize booth to pick out a reward. The bower is from Hearth Song and once you pulled away the curtain, a table of sticky eyeballs, glow sticks, monster suckers and slimy snakes awaited patiently for your choosing. And last, but not least we played the mystery bowl game. I covered the tops of bowls with tin foil and put a slit for the kids' hands and they had to guess what was in the bowls. Intestines (cooked spaghetti), Dracula's eyeballs (peeled grapes), bones (wet pretzels), and witches hair (clown wig) were the four we used. Overall, I have to say it was a great party and most of all, the kids had a blast! The party goers group shot!